The Economist Espresso had a lovely piece of news last weekend about Daniel Barenboim. The Israeli-Argentinian maestro leads his West-Eastern Divan Orchestra this evening in an open-air concert in Berlin. He founded it in 1999 with the late Palestinian-American scholar Edward Said, as an experiment in co-existence. 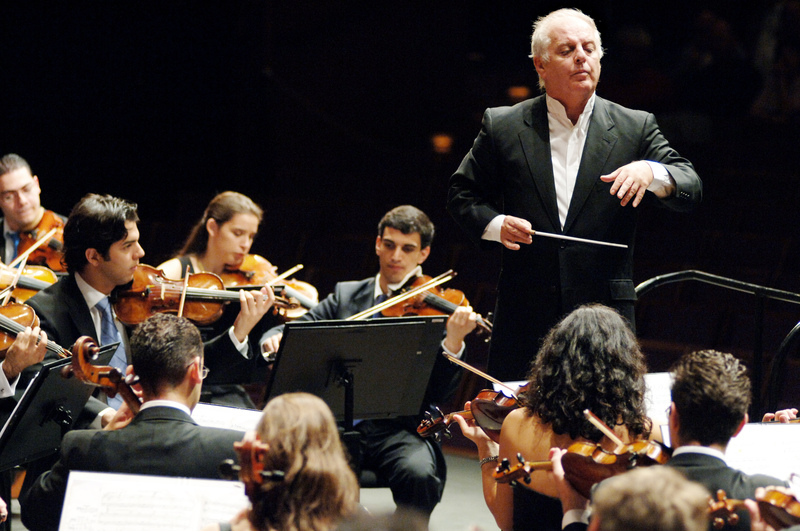 An orchestra alone cannot bring peace, as Mr Barenboim and the more than 100 musicians from Israel and Arab countries concede. But it can further mutual understanding and exemplify the necessary co-operation, patience and courage; the United Nations made Mr Barenboim “messenger of peace”. Tonight’s performance should be especially moving. It takes place in the Waldbühne amphitheatre, near Berlin’s Olympic stadium. Adolf Hitler and Joseph Goebbels had it built in the 1930s, the better to project their propaganda during the Olympic Games that Nazi Germany hosted exactly 80 years ago. What better way to evoke the triumph of humanity over hatred than Liszt and Wagner wafting into the night sky, from this ensemble, in this place? This is an example of a daily act of bravery that can have massive ripple effects. Daniel Barenboim didn’t set out to fix world piece. Instead, he started with an experiment in co-existence in a domain that he had influence in. His influence to make a different expanded with time. He discovered what he probably expected to discover – there is a lot more that is similar about us as humans than different. What is different tends to almost entirely be in our heads – our beliefs and our pre-existing notions about other human beings. It turns out there is plenty. A starting point may just be to reach out and make friends with a few people who are very different from you – different religion, ethnicity, nationality, location. The more we understand and experience the joys of shared understanding across people who are, at first glance, different from us, the more humane we’ll become. And, the more humane we’ll become, the better the chance of building a more humane world together. Thank you, Daniel Barenboim, for showing us how to do so. Great post, thanks for pointing out Barenboim. He has some good performances on Youtube too.